We think we’ll remember every precious moment, funny face, and silly story. And we do! For a while… But the truth is, parenting is a head-full. There’s so much to think about and keep track of that the day-to-day memories often fade until they become just a blur of feelings and emotion. How many times have you clicked on your own Facebook memories to find a bunch of moments that you don’t remember at all? Now multiply that times all the moments – big and small – in your own child’s life. Odds are many of them are going to slip through the cracks, no matter how meaningful they were at the time. There’s a new solution to help you organize all of these memories: LifeTales Child Journals. This provides a fast and super simple way to capture your child’s moments, big and small, while they’re still fresh in your mind. In just minutes a week, you can create a multi-media story including videos, photos, audio, and text to document your kiddo’s life as it’s happening, so nothing is ever lost or forgotten. 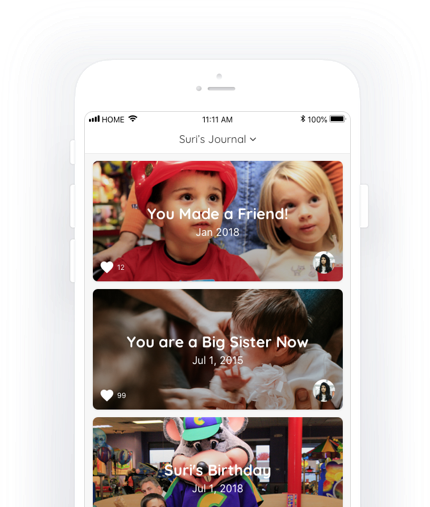 Child Journals lets you add the commentary and memories behind your photos, creating a time capsule to share with your child when they’re older. LifeTales is available for IOS in the app store. For a limited time, LifeTales is offering a Child Journals Unlimited Family Plan for $1.99 a month. Sign up today and you can start capturing those precious moments this holiday season while family and friends are gathered together! Giveaway: Win 1 year of Child Journals’ Unlimited Family Plan! All you have to do is sign up for LifeTales and the 30 day free trial of Child Journals and comment below!